Zeus’s Daughter. 100 years of punishment. Gardenia didn’t ask for it. Yet the Fates brewed their plans ever since before she was born. On the day of gaining knowledge about what humanity truly is, Gardenia decides to do something stupid… create a galaxy without permission. Out of that childish choice, something breaks inside of her and she decides to spend her 100 years with dragons. After searching the stars, Gardenia finds her first teacher and then the next and the next. However, what does one do when one falls in love with your family’s adversary? When one falls in love with a dragon? And what if the Fates are ready to make their move? 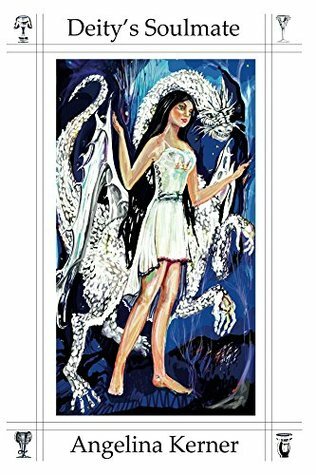 Imaginative, amusing, and adventurous, the Goddess Training Trilogy Book 1 is a tale that will possess you to want to travel the stars. Deity’s Soulmate tells the story of Gardenia, a young goddess on her rite of passage. She must create a world of her own with living beings that worship her as a god. The use of Greek mythology and detailed accounts of the stars demonstrate author Angelina Kerner’s vast knowledge on the subject. I enjoyed the budding cross-species romance between Gardenia and one of her teachers, which grows naturally and includes a twist that left me wondering what will happen next.